Hold onto your hats, it’s another exciting round-up article! This time we scanned the internet looking for the best WordPress dating themes we could find for 2019. Before putting this together, we had it in mind to write a “Best WordPress Dating Themes” article, focusing exclusively on themes developed for that use. 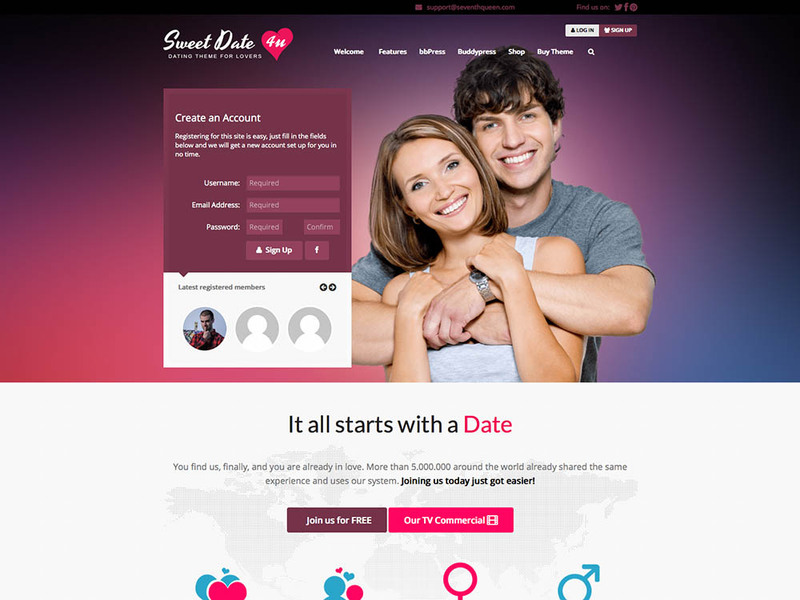 Surprisingly, it turns out there’s very few themes specifically created for dating websites. But we know that some of you have landed on this page from Google looking exclusively for dating themes, and so we want you to know that the top four selections on this list are the best dating themes available at present. 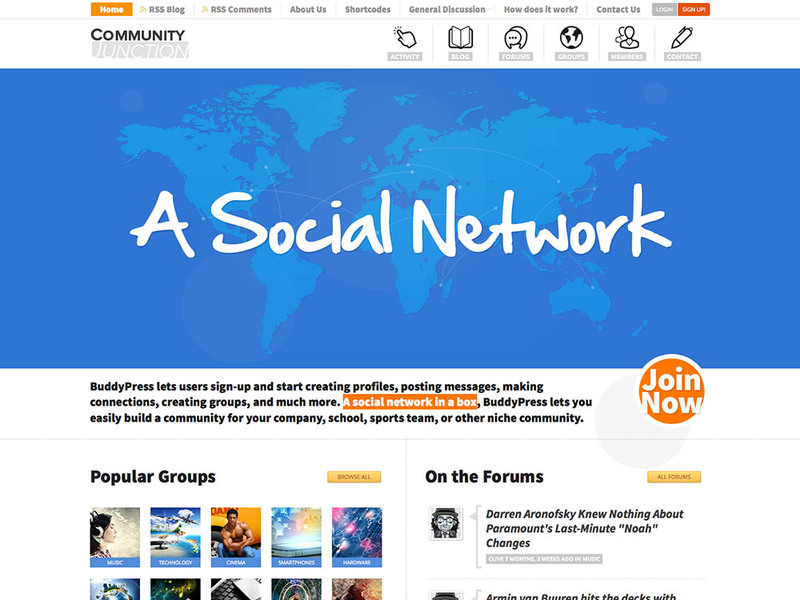 The remainder of the list consists of community themes using the BuddyPress plugin for social and community functionality. With a bit of creative tweaking, any one of these community themes could also be used for a dating site, though bear in mind that they were not necessarily built with that in mind. If you can’t find the WordPress dating theme you’re looking for here, you might have better luck with our related article 11+ Best WordPress Social Network & BuddyPress Themes. It doesn’t get any better than Sweet Date. Plainly speaking, if you intend to build a dating website and you’ve committed to using WordPress to develop it, you could safely ignore the rest of the list and just buy this theme. You won’t get a better out-of-the-box solution for WordPress at this price point. Built with HTM5/CSS3, retina ready and responsive, it’s going to look great and be useable on any device you view it on. And it really does look fantastic; this is a pixel-perfect, well thought out and contemporary design (with options on the backend for customization). You can manage multi-level memberships and subscriptions with an included, powerful and customizable membership plugin, and you can manage the community itself thanks to Sweet Date’s excellent BuddyPress integration. It’s WPML compatible to boot. For a comprehensive breakdown of the many features of Sweet Date, we highly recommend clicking through and taking a closer look. 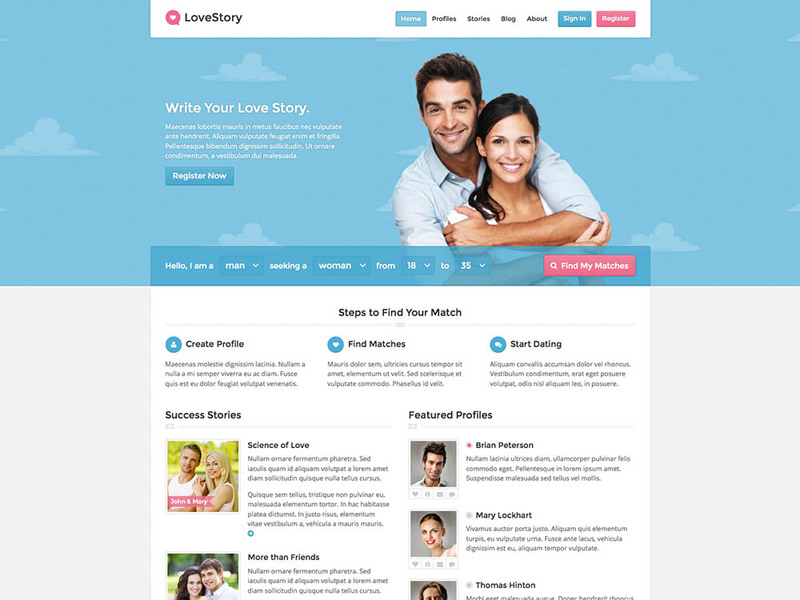 LoveStory is the closest competitor to Sweet Date on ThemeForest, and also an excellent choice for a WordPress based dating site. It has many similar features, including support for membership subscription and fees, extended profiles, and even chat. It really comes down to aesthetics, and although LoveStory is a clean, elegant looking theme, we do think that Sweet Date comes out a bit on top in this regard. It’s responsive, of course, and has many standard features built in, like unlimited sidebars, lots of shortcodes, custom widgets, and a extensive options panel. Integration with Facebook login and Google Analytics pushes this one ahead of some other themes on our list. Gwangi is a versatile WordPress dating theme with five different styles and a lot to offer in terms of plugins and functionality. It comes packed with other premium plugins, as well as designs for classic dating sites, youth dating sites, sensual dating sites, spiritual dating sites, and elite dating sites. Gwangi includes support for monetizing your site using subscriptions through WooCommerce, paid features access, and advertisements. It is compatible with several community related plugins, including LearnDash, Paid Memberships Pro, and more. For matchmaking, it includes a proprietary matchmaking algorithm that works on profile fields from BuddyPress, and it also offers a Tinder-like swipe function, traditional searching, and mutual friends search. Next up is Mingle: the name suggests it could be a dating theme, but it’s not really. It is, however, a robust community theme that supports BuddyPress, and you might want to eschew the traditional pink hearts and soft blue tones you’d usually associate with a dating site anyway. It’s an HTML5/CSS3 theme with lots of features beyond BuddyPress, including a drag & drop builder and a built in contact form. It’s also one of the best-selling and best reviewed themes on ThemeForest, if that means anything to you! This responsive community theme is a bit older now, but the team behind is constantly updating it and keeping it relevant. It’s one of the first of its kind, paying special attention to BuddyPress for communities and groups, and it integrates bbPress for forum functionality. The premium Slider Revolution plugin is included with the purchase as well. Aesthetically, Salutation boasts an understated, classy and minimalistic design, and you can further customize the look of the theme using the powerful control panel provided on the back end. A solid pick if you want to avoid getting bogged down by features you won’t need. 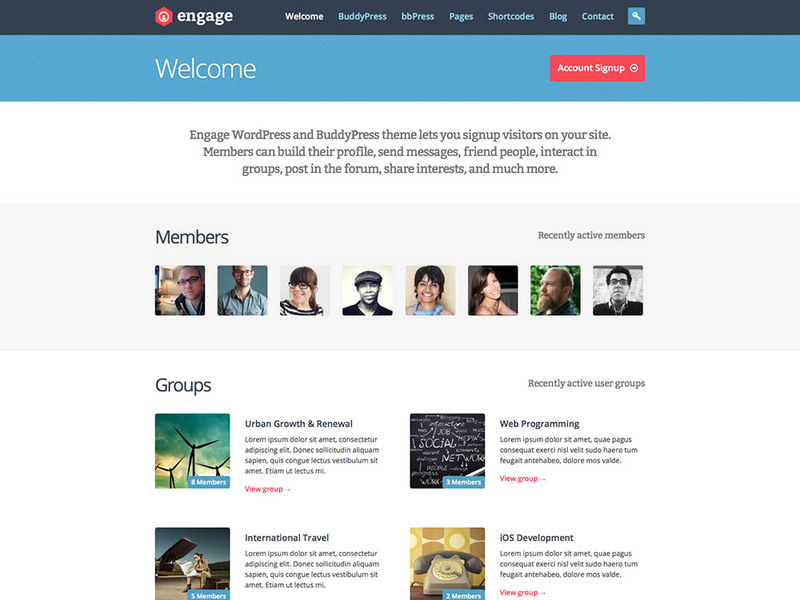 In terms of design, the Engage theme is easily one of the best on this list. It’s got that flat, modern look that’s all the rage these days, and it’s ambiguous enough in appearance to make it very versatile. Engage would definitely work for a dating site, even despite a lack of vector art hearts and soft pastels. It might even be better for it. Aside from being beautifully designed, it’s got all of the features you’ll want too, and it should come as absolutely no surprise at this point that its claim to fame is support for BuddyPress and bbPress. Layered PSDs are included for customization (not always the case these days), and the theme options will give you even more control over presentation. Engage! Hey, guess what popular plugin this theme uses to provide community functionality? Do you give up? It’s BuddyPress! 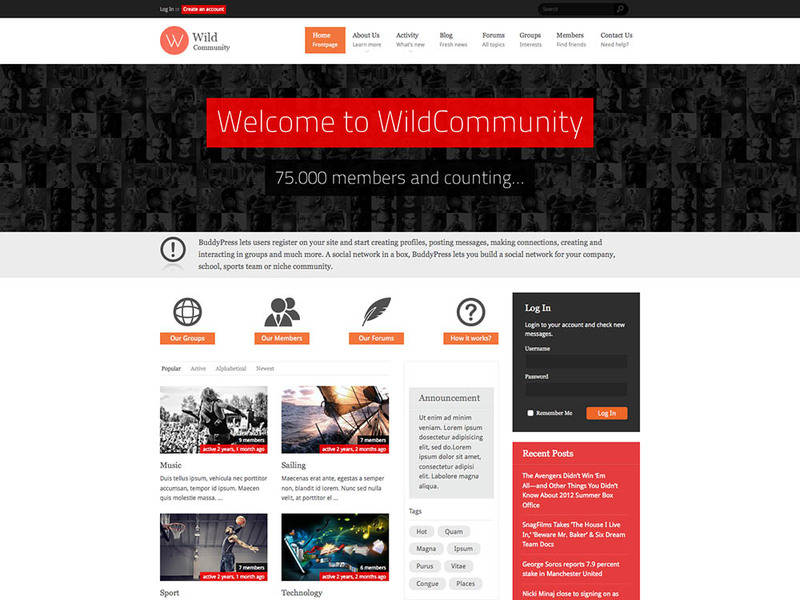 Though there may be nothing particular mind-blowing about Wild Community in terms of either design or features, it is another extremely solid option for building a community website, and for all we know could be exactly what you’re looking for. So here it is. Check it out or don’t. No need to be weird about it. 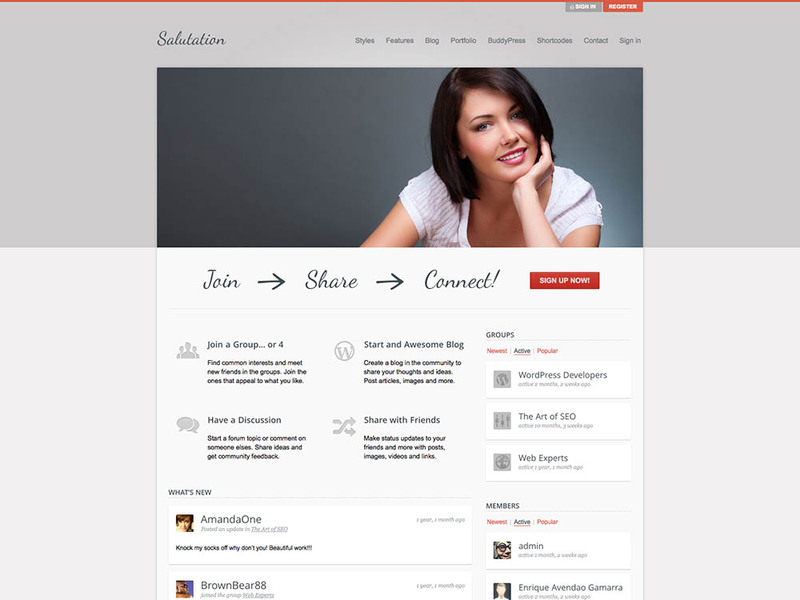 A slick looking community theme developed by Diabloque on ThemeForest. 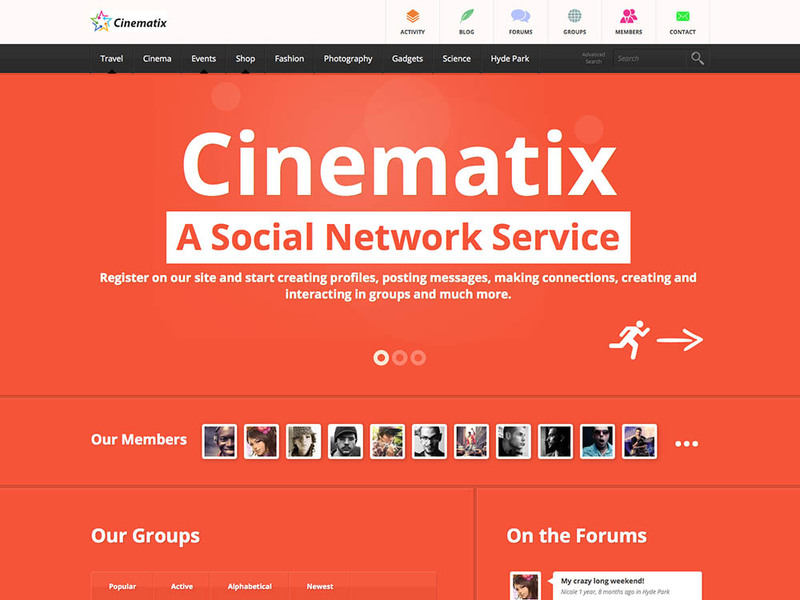 Users can create profiles, message other users, build groups, post messages and more. Lots of potential uses here: company, school, sports, various social clubs, you name it. This responsive, translation-ready theme is easy to install and includes step-by-step instructions. 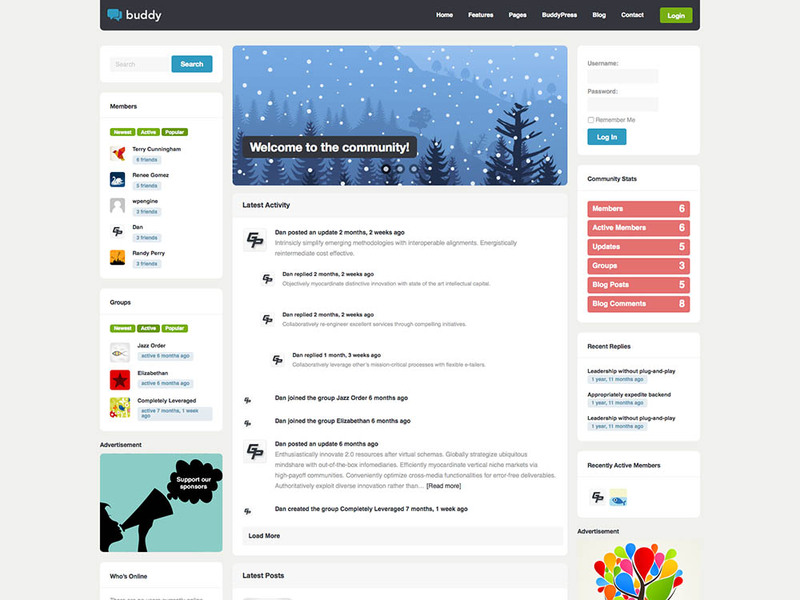 Buddy may not look the part for a dating site, but it’s definitely one of our favorite community/BuddyPress themes. 100% responsive and retina-ready, it really needs to be seen to be fully appreciated. What we like about it most is that it goes in a slightly different design direction than competing themes, with a homepage layout that has more in common with Facebook or Twitter than it does with the homogenous business and marketing layouts you may be accustomed to. It’s got lots of shortcodes for building custom layouts, it’s easy to use and it’s SEO optimized as well. A ‘skin manager’ allows you to make cosmetic changes without needing to know any code or do any image editing. We’ve gotten kind of far away from the romantic aesthetic of the Sweet Date and LoveStory themes, but it’s hard to ignore a theme that looks like Cinematix. Even if it’s not quite what you’re looking for, it’s worth clicking through just to see such a fine example of vibrant, lovely design if you’ve got the time. I’m not going to detail the features, just know that it has as much to offer as any other community theme while looking twice as good. Here we are at our final “community” theme: Kleo. Touted by the developer as a ‘next-level’ theme, this multi-use theme can be used for a ton of different types of sites, not just online communities. Pinterest style sites, e-Learning sites, agency sites and more are supported and feature their own unique design. 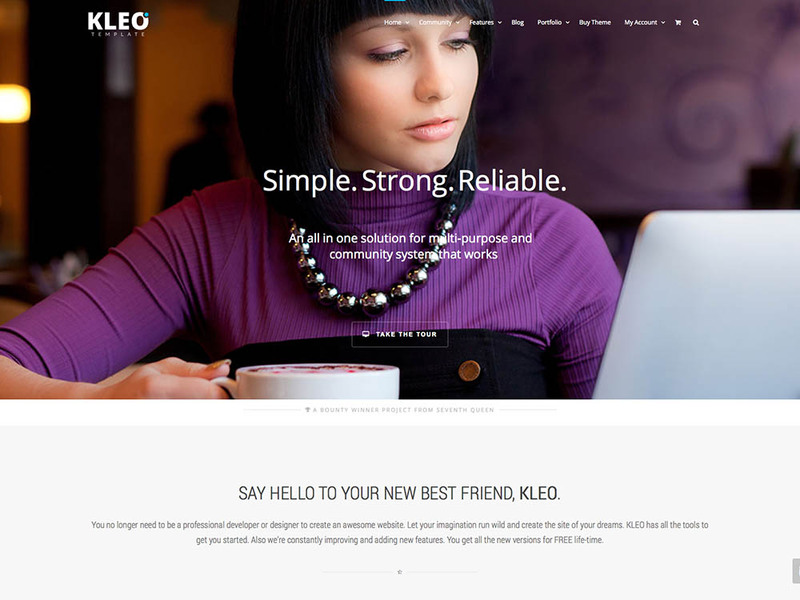 Kleo is basically a bunch of different themes in one, and, for better or worse, probably represents the future of WordPress themes. A great value, and an impressive effort by the developer, though it might be overkill if you’re looking for something a little more tailored to building a community website. 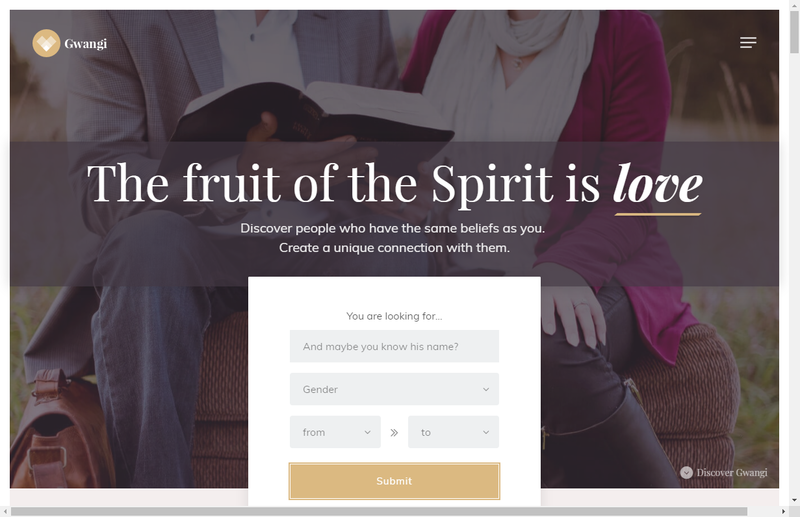 Like one of the themes above, but don’t want to go through and do all of the work to build and customize your dating site? Well, here’s a great option for you. For $75 on Fiverr, you can have one of the themes above installed, and get an entire WordPress dating site set up, including membership levels, profiles, and more. Check it out — it’s a serious time saver. That’s all for now. As always, if you have any additions, or think we missed a dating/community theme that ought to be featured on this list, let us know in the comments. We’ll be updating it as new stuff comes along. I surprise how much attempt you place to create this type of fantastic informative web site. Here are some issues you’ll run into with a dating plugin for wordpress. Most likely the plugin will conflict. This is because it uses it’s own java. There are so many combinations of themes and plugins that it will conflict with something. Also, WordPress was not designed to be a dating site. While it’s a CMS, it’s a blogging platform. You might be able to sustain a site but once you get members it will slow down. So, ask yourself. What major dating site uses WordPress? None do. There is also a free (yes, free !) 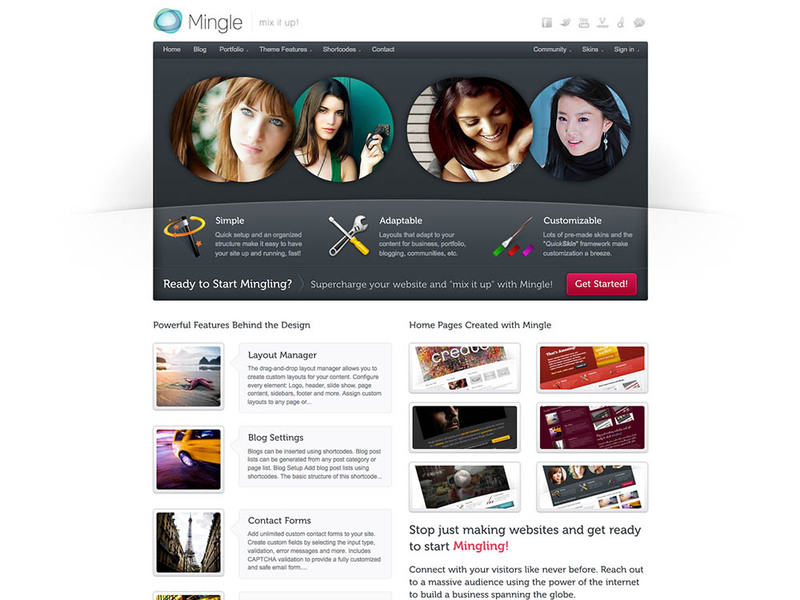 plugin especially dedicated to the creation of a dating website : Rencontre. What is the name of this plug in?